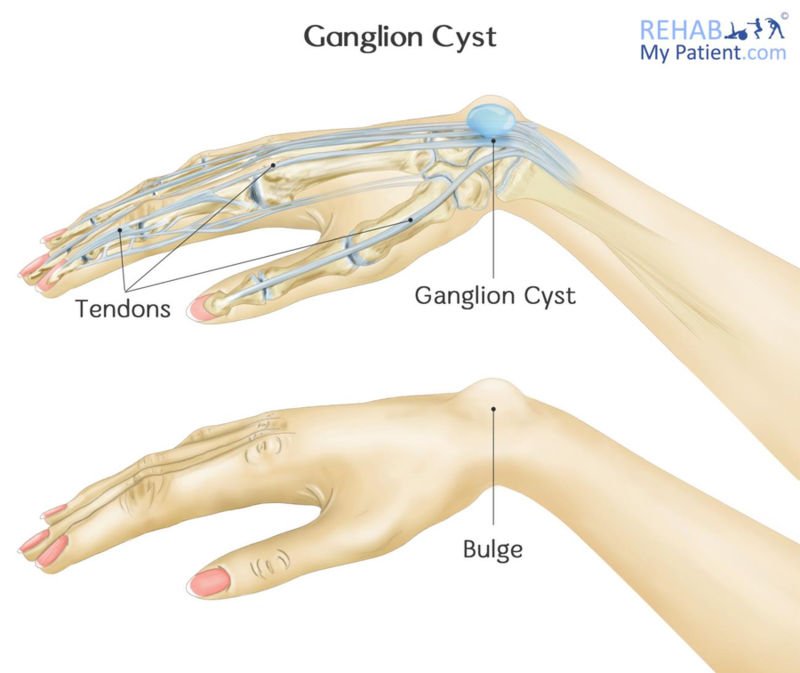 Ganglion cysts tend to be the most common of all lumps or masses in the hand. Since they aren't cancerous, they tend to be harmless in the majority of cases. They can occur in any number of locations, but they often develop on the back part of the wrist. These cysts are filled with fluid. They can appear and disappear quickly, as well as change in size. Many of these cysts don't require treatment. If the cyst becomes painful, has an unacceptable appearance or interferes with normal functions, several methods for treating the condition are available. Often the cyst can develop for no reason, but sometimes it is due to overuse of the hand or wrist, such as those who are manual workers or weight trainers. A ganglion cyst rises from the joint, such as that of a balloon on a stalk. It will grow from the tissues that surround the joint, such as the tendon sheaths, ligaments and the joint linings. Inside of the balloon is a thick, slippery fluid that is similar to that of the fluid lubricating your joints. These cysts can develop in any number of joints within the wrist and hand, such as that of the base of the finger and the joint at the end of the finger. The cysts can vary in size. Depending on the situation, some tend to grow with an increase in activity. With the rest of the cases, the lump will decrease in size. Since the ganglion cyst isn't cancerous and it tends to disappear over the course of time, most doctors recommend waiting and watching the cyst to make sure there are no unusual changes in the cyst. When symptoms aren't present, the best thing you can do is to leave it alone and monitor it. Painful repetitive activity tends to cause the cyst to increase in size. It also places an increased amount of pressure on the nerves, which ends up causing you pain. A splint or wrist brace can help to alleviate some of the symptoms and case the ganglion cyst to decrease. As the amount of pain decreases, the doctor will be able to prescribe specific exercises for strengthening the wrist and working to improve movement. If there is a lot of pain and a decrease in the amount of daily activities that you can participate in, you may need to have the fluid drained from the cyst. Some practitioners may decide to hit the cyst with a hard book to try to disperse the cyst. It can take a few hits and those hits do need to be quite hard. It is not an accepted medical treatment, but you can often find practitioners who have experience with the technique. Most of these cysts will form a lump that is easily visible, but the smaller cysts can hide underneath the cyst. The doctor will examine the size, length of time you have had the system. Applying pressure to the site can help to identify where the tenderness lies. If the cyst puts pressure on all of the nerves passing through the joint, it can end up causing tingling, pain and weakness in the muscles. Large cysts tend to be a cause of concern with an individual's appearance as they look like a visible lump. Easiest to use exercise prescription software! Start your free trial today!